The Illinois House and Senate have passed House Bill 0043 which will require motorists to STOP for pedestrians in crosswalks. The law is expected to be signed into law by Governor Quinn and go into effect as soon as he signs it. The current law is vague and merely says that motorists must "slow down or stop if need be" for pedestrians in a crosswalk. The new law is more clear and definite. It leaves no room for argument as to whether a vehicle slowed down "enough." The law simply says that motorists must stop and yield for pedestrians in a crosswalk. This will make the streets much safer for everyone. 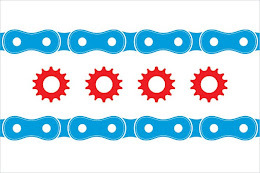 This is a tremendous victory by our friends at the Active Transportation Alliance, formerly known as the Chicagoland Bicycle Federation. The legislative team at Active Trans has worked tirelessly over the past two years to get this bill passed. Attorney Mike Keating was privileged to get to offer pro bono lobbying services on behalf of Active Trans to help spread the message to state legislators and to other community interests about this important law. Congratulations again to everyone at Active Trans!